Kirk Bjorndahl has been a professional artist for twenty years. Kirk was a member of the National Art Honor Society in high school and later he graduated from Luther College in Decorah Iowa with a Bachelor's Degree in Studio Art. 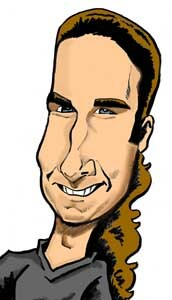 Kirk has been drawing caricatures professionally for twenty years and has drawn well over ten thousand faces. He has been seen caricaturing at Six Flags Over Texas in Dallas Texas, at the Texas State Fair in Dallas, and in the malls of Austin, Texas. His pencils, paper, and airbrush have also been spotted at the Mall of America in Minneapolis, Minnesota, and some of the smaller malls of the Twin Cities. Local arts and crafts festivals in Minnesota and Texas have witnessed Kirk do drawings for local patrons. For the last few years he's drawn at the Minnesota State Fair and the Tulsa State Fair. Kirk has done graphic illustration for some major companies such as 3M, Allina Health Services, and Hormel Foods. His graphic web design is all over the United States in places like Texas, Florida, Minnesota, California, and Vermont, and also across the pond in the UK, Germany, and Italy. He's produced coloring books, Flash cartoons, and paintings. In recent years Kirk has worked with Magician Tim Sonefelt and illustrated two children's books featuring Larry the Duck. Having been on the web since 1996 offering his artistic talents, Kirk's art, such as painted portraits and numerous caricatures and cartoons, are all over the world. The content presented on this website is informational only, it does not count for credit at any learning institution. Kirk is a professional artist, but is not a certified art instructor.